WHAT ARE THE 8 STEPS? Every business has 8 core areas required for the foundation of their business. 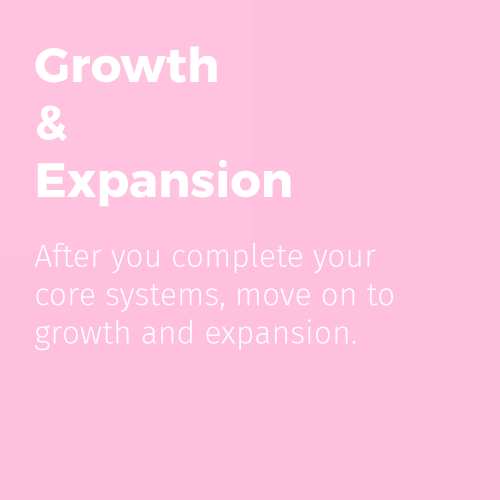 These 8 core steps should be done before you move into any of the systems we recommend in the Growth & Expansion. Steps 1 & 2 are the evaluation process of your idea and plan. Steps 3 through 8 entail actual systems or a process which you must go through for that particular area. Within each section we will provide you the systems, tools, resources, and recommendations we think will help you maneuver and complete the set up of that particular area of your business. During this step you will determine the value you are bring to the customer by using the information you completed in step 1. Here you will complete your SWOT Analysis to help you gain a better understand of what you want your company to represent and your branding throughout the future steps. There are multiple areas to be aware of legally for a company. Some areas are more important during the phase of startup than others. We will give you insight and resources to help you address them. Getting your accounting set up from the start to manage the bookkeeping down the road is imperative to making sure you are on track financially to meet your goals. Remember: What you can't measure you can't make better. By this step, you have legally set up your company and registered it with the state. Here we will help you choose a domain and set up email under that domain name. Branding consists of multiple factors, from colors, fonts, sizes, etc. Here we will give you insight on how to complete your BRAND IDENTITY Book. Plus, we will provide resources to complete all your online, social media, and print materials. Every company must be able to receive payments in a form convenient to your customer. Here we will walk you through a personalized consultation to get you up and running with the most cost effective solution. In this step we will help you determine if you should have an information site, e-commerce, funnel, or course site, and maybe even a combination of. Plus, we will provide the best systems to get you up and running quickly and most efficiently without overwhelming complexity. Each steps includes a quiz to initiate the process of unlocking the resources, tools, and system recommendations we have for you in that particular area of your business. Immediately following the completion of each quiz designated to each step, you will be emailed your quiz results along with instructions, tools, resources, and system recommendations for that particular step.